Now that’s something you don’t see every day: the whole of Facebook is down – the website, the APIs, the social buttons, etc. Oh, and I think they need to update the copyright year on this page. 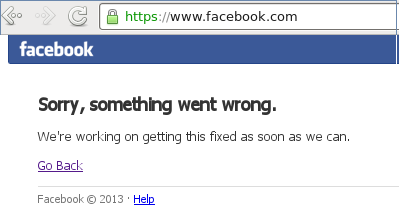 How many “f*cks” per second do you think one could hear in the Facebook office right now? The productivity of the whole world just spiked! Facebook users are now roaming the streets in tears, showing photos of themselves in people's faces & screaming 'DO YOU LIKE THIS? DO YOU? Once again Google demonstrates the proper way to handle issues. Due to their software update, some users temporary lost access to emails. Instead of hiding and silencing, Google published a blog post explaining the issue, as well where and when more information would be available. Not to mention that loss of service is an extremely rare occasion, and loss of data is even more so. This time, it seems, all data is recoverable from tape backups. All it takes is a little time. Imagine the sinking feeling of logging in to your Gmail account and finding it empty. That’s what happened to 0.02% of Gmail users yesterday, and we’re very sorry. The good news is that email was never lost and we’ve restored access for many of those affected. Though it may take longer than we originally expected, we’re making good progress and things should be back to normal for everyone soon. In times like that, keeping your users up to date is vital. All the press releases and marketing newsletters in the world won’t buy you a fraction of the trust that a simple blog post during the downtime will bring you. Last night the server ran out of disk space while doing a backup. That affected most of the sites and some services hosted on this server. I have cleaned up some space since, and made sure that there will be enough of it for the backups to run. I’ll also keep an eye on it to see if there was some other problem hiding behind the disk space issue. Apologies to everyone who was affected. None of the sites hosted on my sever were accessible for most of yesterday. That was caused by some emergency maintenace done by the hosting company. They didn’t warn me before, so I weren’t aware of it coming and for how long it would last. This is the third downtime for this month. Needless to say, I am not satisfied with the service no more. Firstly, the downtimes are too frequent and too lengthy. Secondly, total absense of notificatios – either before the downtime or after. No explanations. Nothing. I’ve been with this hosting company for more than two years now and it was OK most of the time. But now, once again, I am thinking about moving somewhere else. Suggestions? Apologies to those of you who noticed a brief downtime last night.Â My hosting company was moving the database from one IP address to another, and they have warned me about it a few times early on the way.Â All I had was to update configuration of the blog, but somehow that slipped through my memory.Â Once I noticed the problem, it was trivial to fix.Â Everything is back and should be working just fine now. This blog wasn’t the only one affected – I’m hosting quite a fewÂ web sites, and most of them had the same problem.Â As far as I can see, all of them are up now.Â Let me know if you notice that something is still broken. I’m doing lots of silly stuff.Â Who else could post a few articles in the morning, and then start with major WordPress upgrade?Â Surely, there was a disruption of service while many of your came to read the posts.Â Sorry, guys. The good news is that I finally did it.Â The blog was lagging behind the recent security updates and new features, running on WordPress 2.2.2 .Â Today I updated it first to 2.2.3, which went without any problems.Â Then I went for 2.3.1, which broke a few things.Â I had to remove a few files and re-upload them and then fix a few places in the database and adjust the theme a bit. All my posts were under a single category, and were tagged with Ultimate Tag Warrior plugin, which WordPress 2.3 provided an import for.Â That thing didn’t work properly.Â Probably, because I have a few thousands of posts, and a few thousands of tags, and importing them all takes more time than a browser is willing to wait without timing out. But I don’t care for that right now.Â It was a mess anyway.Â Some posts got tags imported, others didn’t.Â I’m not going back to fix them all. What’s done is done and it’s time to move on.Â All posts will still remain under the single category (General), but that won’t be displayed.Â Instead, you’ll see the tags to each post.Â I’ll try to keep them orderly, and maybe even organize them a bit later.Â For now, if you want to find something, use the search box of this site, Google, or drop me a line and I’ll try to locate the bit for you. If you notice any misbehavior of the site, please let me know.Â Thank you. You don’t want to wait for a filesystem check to finish, when it’s working on a 200 GByte partition. Hopefully, this tip explains the 5-hour downtime that the server experienced from today’s morning and until now. I’ve been promising some fixes to Olga for about six month now. No music played in our living room during this time. And Maxim was continiously getting closer to power cables and outlets. So, today I fixed everything. Appologies for a little downtime, by the way. I had to rearrange my harddisks and move about 80 GBytes of mp3s and oggs. I also had to disconnect power cables in order to properly move all cabling behind the table, so that Maxim won’t reach it. Or at least where he won’t see the cables so often. Oh, my! What’s going on? Who’s next? Slashdot? Google? I rushed to check both of them, but they seem to be OK. Good. I’ll have something to read for the next hour. Posted on December 15, 2005 Author Leonid MamchenkovCategories All, PersonalTags Bloglines, downtime, webLeave a comment on Bad morning. Bad!